Since my time is limited in the mornings, I’ve figured out a really quick and delicious breakfast solution. The only issue is that my wife has a gag reflex just at the sight and thought of it. In fact, I know some of you are probably going to think the same thing, but trust me, what I’m about to tell you is yummy AF. Hit some boiled eggs. 11 minutes in boiling water is the correct answer. While they’re boiling, cut up an avocado. Reach in the fridge and grab some feta cheese (get the crumbles) and ketchup. In a plate, squirt a generous amount of ketchup and dump some feta next to it. 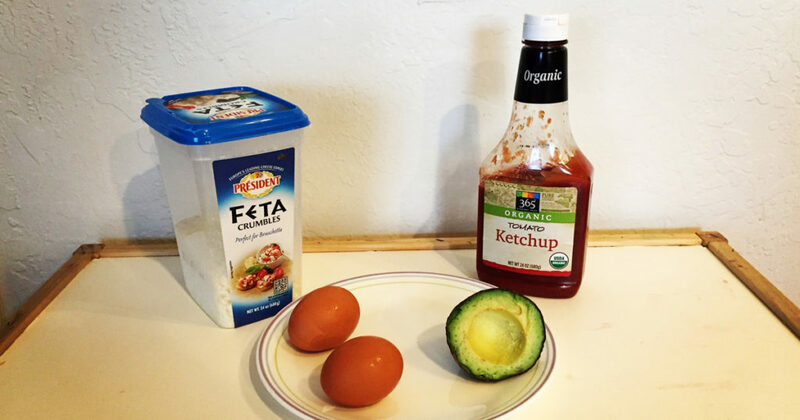 Take an egg, DIP it into the ketchup and then DIP it into the feta (the ketchup will act as a “glue” to the feta). Take a spoon and place a slice of avocado on top of the egg (you’ll have to take a small bite of the egg initially to create a recurring flat-egg surface). TAKE A BITE AND WATCH YOUR BRAIN EXPLODE. Repeat the dip action with feta, ketchup, and avocado for every bite. Crush your goals for the day. Reach your dreams. Become a Superstar. This is my wife’s reaction when she sees my plate. It’s called gastronomy. Ever heard of it, bro?? Would you eat my delicious recipe? Comment and let me know! And if you have any weird food combos, share them! Oh, and be sure to follow the shenanigans on Facebook, Instagram, and Pinterest. You can email me directly to say hello too!